The Newsletter, a substantial illustrated booklet, is published three times a year. It contains short articles, and lists lectures, exhibitions, courses, workshops, day schools and visits. 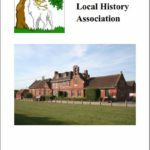 It has news about individual members, and news from local history societies, libraries, museums, and the Berkshire Record Office, and it carries reviews of new publications.